Add a companion submarine to Moebius Models’ 1/350 scale Seaview model. This small Flying Sub is ready to go – just paint and add to your Seaview kit. 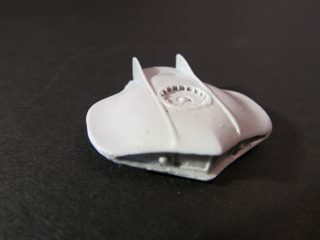 Fits into the Flying Sub bay that is included in ParaGrafix photoetch set PGX118 for dramatic diorama possibilities. "Voyage to the Bottom of the Sea"™ is © Irwin Allen Properties, LLC and Twentieth Century Fox Film Corporation. Licensed by Synthesis Entertainment. All Rights Reserved. "The Fantasy Worlds of Irwin Allen"® is a registered trademark of Synthesis Entertainment. All Rights Reserved. Moebius Models® is a registered trademark of Moebius Models.